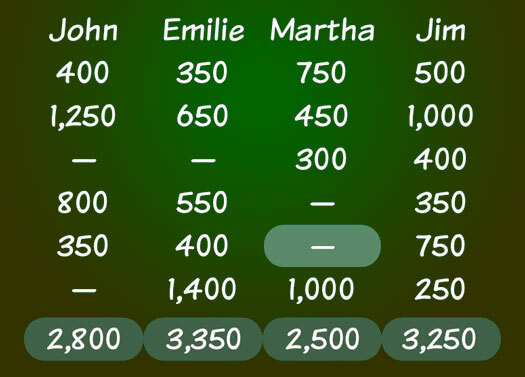 A simple & easy way to track scores when playing games. 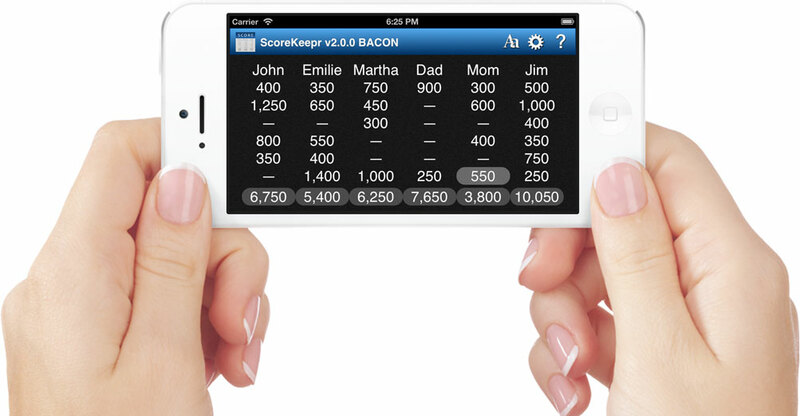 Use ScoreKeepr to keep score for playing cards, dice, dominoes, golf and all sorts of games. 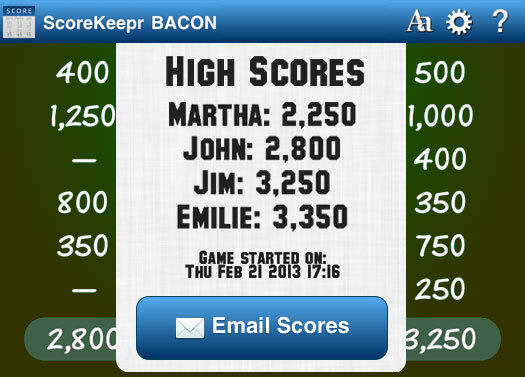 ScoreKeepr FREE is for up to 4 players and 20 rounds. ScoreKeepr BACON can have up to 99 players and 99 rounds of play, no ads, saves games and opens previously played games and more backgrounds featuring BACON! Right at home on the larger screen on an iPad. 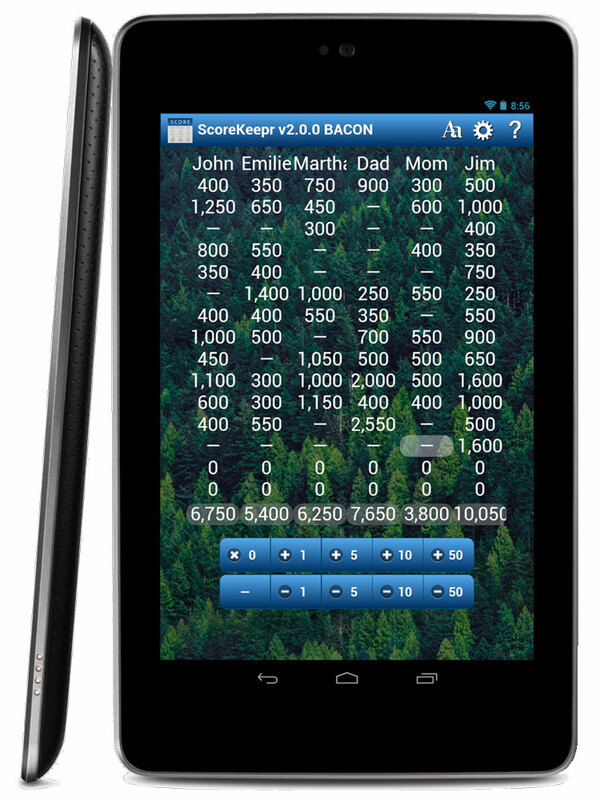 ScoreKeepr is comfortable working on phones and tablets, adjusting itself to the screen, and is optimized for Retina-capable devices. 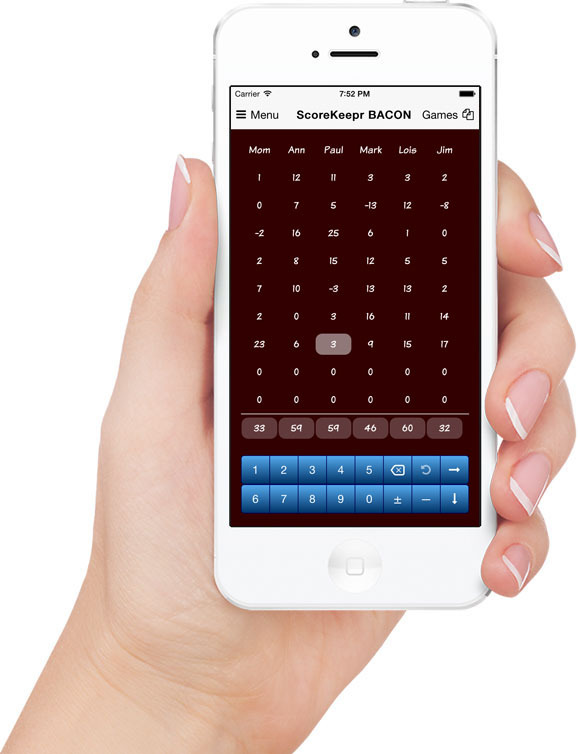 ScoreKeepr automatically adjusts to the size of your device, and lets you customize the font size, type and background to your liking. Rotate your device to fit everyone in. 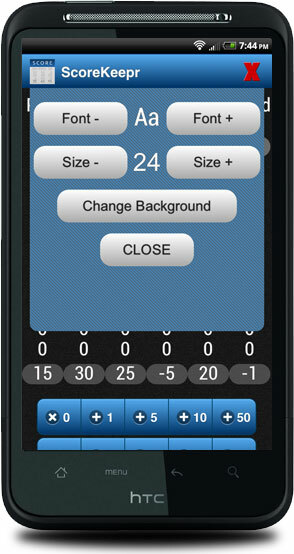 Use ScoreKeepr in portrait or landscape, whichever you prefer to make the most of the space available. 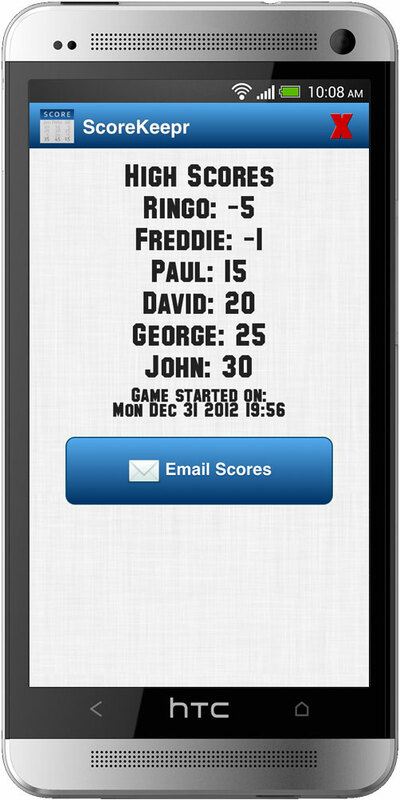 Just like you'd do on paper, scores are entered in rows, with a column for each player. Tap on a cell where you want to enter a score. Scores are entered with numbered buttons. For example, to enter 37, you would tap +10 +10 +10 +5 +1 +1. The Next button moves one player right. Tapping the Totals line opens the Leaderboard. Scores are shown lowest to highest. Share the scores with the Email Scores button. Set your preferences in the Display (Aa) menu for font, font size and background. Add players and rows in the Game (gear) menu. 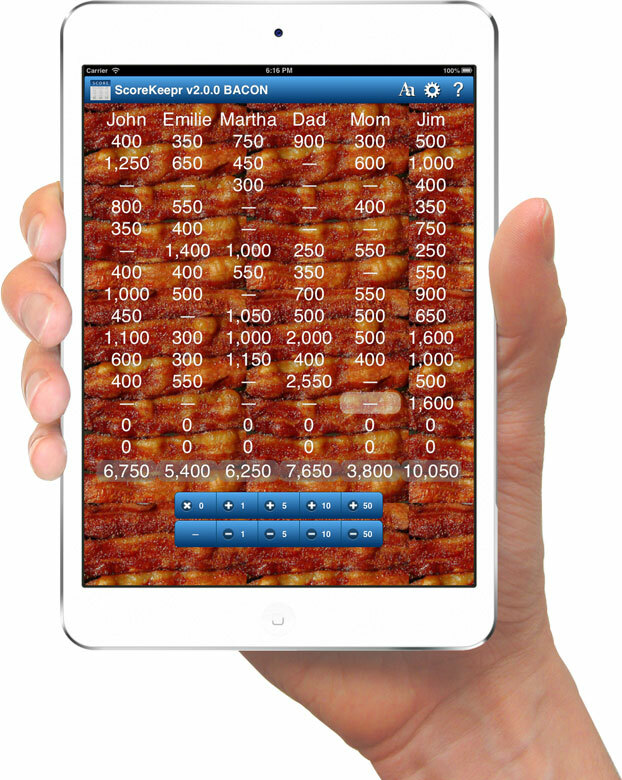 Tap New Game to start a new game, or open a saved game (BACON version only). 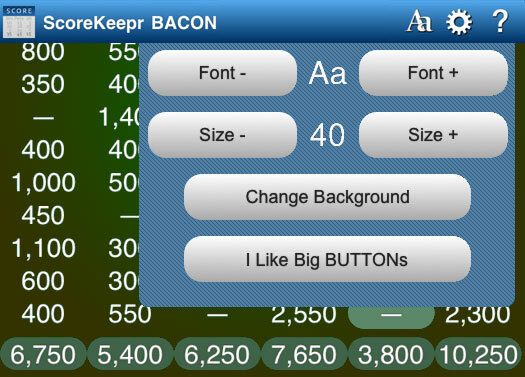 On tablets, you can make menus and scoring buttons bigger with I Like Big BUTTONs.